Analogix was at the Displayport booth during CES showing off their MyDP silicon and adapters. Their brand is called SlimPort, and if you are not familiar with either spec, it is basically a cell phone to HDTV video cable. The current state of video standards is a mess, mainly because of blatant greed and it’s effect on standards processes. DVI, HDMI, and DP all do the same thing, but there are three standards, plus a handful of form factors for each one. That doesn’t even begin to touch upon various revisions of each one either. DVI and most DP variants are royalty/license fee free, but HDMI is borderline abusively priced. DP was in many ways the protest standard for those fees. Luckily, the newish MyDP is one of those DP specs that appears to be free of extreme fees. MyDP is not just technically interesting, but it has the potential to be very useful, and the Analogix silicon was quite cool too. The idea is simple enough, a little adapter that will plug into a cell phone’s essentially mandatory micro-USB port and allow you to display pictures on a big screen. It has to be flexible, robust, and of course low power. Since it is a mobile oriented spec, it should fit in a small adapter too. The Slimport device Analogix was showing off did just that. As you can see, this cable takes up very little space, and has both mini-DP and VGA ports out. DP is the easy part, if the USB port supports MyDP, it does have DP, so that is more of less a passive pass through. VGA on the other hand is considerably harder and requires active circuitry. That is where Analogix comes in with two parts, the ANX7805 and the ANX7808. Of the two, the 7808 is more interesting because it supports MyDP directly, the 7805 will only output to Analogix SlimPort devices. 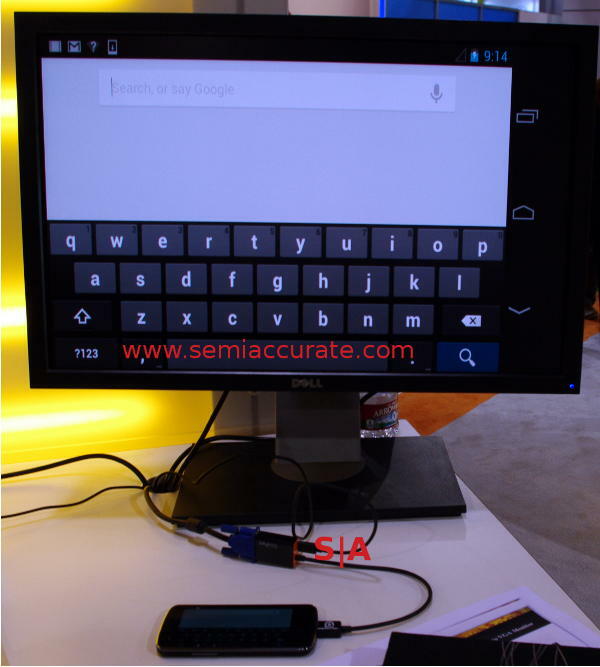 While it wasn’t specified at CES, being at the DP booth means the pictured device is probably based on an ANX7808.